As this year's Charity Corner comes to a close at 11:59pm NST this Friday, we look back and reflect at this whirlwind of a weeklong event that caught many people off-guard after a break in 2016. While previous events occurred for two weeks and in the autumn (2015) or at the end of the year (2014), this year introduced an event during the usually uneventful month of February. This year Granny Hopbobbin requested books, beverages, food, furniture, gardening, and gifts. (The latter category making many question what constitutes a gift!) We were welcome to donate five items from one of these categories that were of a similar rarity to one another, in exchange for which we would receive a random item of the same rarity range. Items in these categories changed drastically in price. While previously labelled ‘junk’ rose as much as 30,000% in cost, items that were given out as rewards began plummeting in price (notably clothing, morphing potions, and stamps.) As in previous years, this truly demonstrated the principles of supply and demand. We were a community divided: some donating as much as at all possible, others opting out and instead focusing on buying and selling items. Bank accounts changed dramatically this week, with everyone in the first category hoping for that elusive R99+ stamp or unbuyable morphing potion. 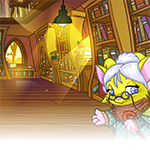 Few had much time or energy left to look into other pursuits, but the week was even more eventful for those who did: boosting stamp collections, helping pets finally get that previously unbuyable item of clothing, and helping pets become the colours and species they have always wanted to be. People far and wide scoured their safety deposit boxes discovering items long forgotten and began remembering which Dailies gave out prizes that fit these categories. We went apple bobbing and fishing. We travelled the Neopian globe from Coltzan’s Shrine to the Lunar Temple. There was a mass battle against the S750 Kreludan Defender Robot, Koi Warrior, Giant Spectral Mutant Walein, and Jetsam Ace in the Battledome when it was found they gave out more rare items that could be donated (for example Galaxy Energy Drinks, Deluxe Water Pizzas, and Space Rock Soups.) Hoarders found they suddenly valued their Buried Scrolls, Haunted Milk, Realm of the Water Faeries, Scrolls of the Sea, Outdoor Pirate Flags, and Twirly Plants. When donating more rare items, clothes seemed to be given out by Granny Hopbobbin in abundance. Less often, unpainted petpets and petpetpets found new homes. Our researchers interviewed Granny Hopbobbin, a longtime Acara resident of Terror Mountain. She keeps her yellow complexion unlike many elderly Acaras and prefers a dress with a few more stars, but was seen sipping hot cocoa like many of her colour and species. Indeed, we remembered with fondness how she used to say: “Oh my, dearie, you deserve a big hug and a mug of hot cocoa for having such a warm heart.” This year she was again overwhelmed and happy by the response to her request for help for those Neopians in need. She made a point to note that this was the reason she decided to hold the event in February, as many need our help not just during the autumn and December. She spoke well of those members of TNT who helped team up with her this year and lent a hand. Binary Supagoo (who many of us know as an avid Darigan Citadel goalie) stated he was delighted by the number of books donated, and swore he’d find a good home for all the copies of Neovian Darkfall and that the Deserted Desert Scrolls would no longer be deserted. Meanwhile, Firefly (a defender for Kiko Lake during Altador Cup season) was happy with all the Twirly Plants and stated a community forest of them would be planted. Country Queen (aka. Faerieland’s Defender) stated all the food had already found good homes. Naturally Firefly and Country Queen – both playing in the position of Defenders – seemed a bit competitive. When asked, they laughingly admitted that yes they’d absolutely kept tallies of how much each had received. To her credit, Country Queen acted with perfect grace at how much more food had been donated, and both emphasized that it was the act of giving that was most important and that all the food and furniture would be useful. Our researchers tried to find out a little about this year’s Altador Cup season, but the staff of TNT kept quiet with twinkles in their eyes. Yet not all who donated did so just for the gift of giving. A question on many Neopian’s minds was whether the Charity Corner avatar would be re-released, and whether they would need to donate 2,000+ times to get a gold trophy. Neocash donations were also welcomed back, after being a popular part of the 2015 event. Like in that last event, users could trade in NC items in exchange for Donation Receipts. The Ash Blonde Wig, Flower Blossom Dress, and Coral Wig were widely reported as the most popular items to get in exchange for those items that were previously gathering dust at the bottoms of our closets. Meanwhile, the Embellished Feathers Dress was a bit too feathery for some. As usual, trinkets were least popular, with the Succulent Planter Tree being many people’s pick for “least favorite”. Whether happy or with regrets, all of us are exhausted (not least the Shop Wizard who has stated he’s going to take a long bubble bath after all of this is done.) And yet we can not help but wonder and speculate about the next Charity Corner. Did Granny Hopbobbin give out so many clothes that she’ll now need to request some next time? Will we finally be able to get rid of the grooming items we’ve been hoarding all these years? Will the categories remain the same? Whatever the answer to these questions, it is unsurprising that many of us have suddenly decided to become hoarders of items we previously saw as junk and now see as potential (literal) treasure.